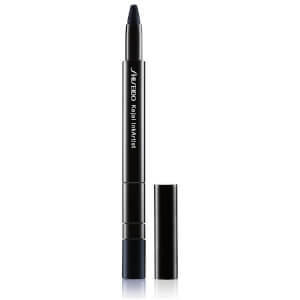 Define eyes with the Shiseido Kajal InkArtist; a 4-in-1 eyeliner, kajal, eyeshadow and brow colour that delivers bold, 12-hour waterproof wear, an even glide and weightless feel. Arriving in a range of striking shades inspired by ancient and modern Japan, the InkArtist delivers smudge, crease and tear-proof wear with high-impact colour payoff. Its soft, graduated point lends precision and can create both thin and wide lines with its angular shape. A detachable sharpener maintains the tip’s shape, whilst a built-in sponge can be used to smudge and blend for smoky looks. Expect eyes that command attention. Dimethicone, Trimethylsiloxysilicate, Synthetic Wax, Polymethylsilsesquioxane, Octyldodecanol, Caprylyl Methicone, Polyethylene, Synthetic Fluorphlogopite, Stearoxymethicone/Dimethicone Copolymer, Polyhydroxystearic Acid, Boron Nitride, Mica, Disteardimonium Hectorite, Lecithin, Propylene Carbonate, Tocopherol, Dicalcium Phosphate, Ascorbyl Palmitate, Citric Acid, [+/-(May Contain/Peut Contenir)Ultramarines (Ci 77007), Titanium Dioxide (Ci 77891), Iron Oxides (Ci 77499), Carmine (Ci 75470), Iron Oxides (Ci 77491), Ferric Ammonium Ferrocyanide (Ci 77510), Iron Oxides (Ci 77492), Yellow 5 Lake (Ci 19140), Blue 1 Lake (Ci 42090)].